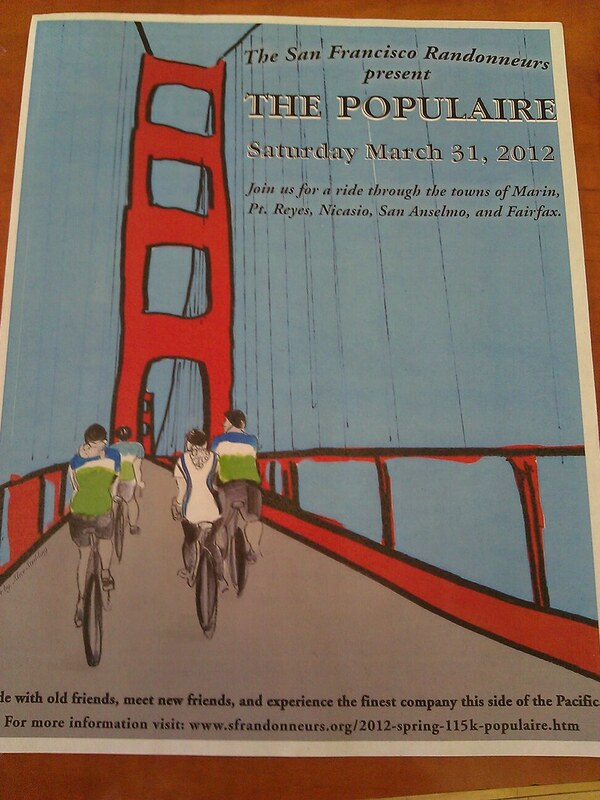 SF Randonneurs Populaire - This Saturday! With a fair degree of trepidation - potentially challenging weather is not a problem, but I’m definitely still a bit under-miled… Ahh well, how can you not get excited about a ride when it has such great artwork? The artwork is by Alice Stribling, which can be viewed in its original form (but seemingly not linked to or downloaded) here. Anyway, the San Francisco Populaire rolls north from the Golden Gate Bridge at 7 am this Saturday - check in and/or sign up is required, so don’t show up at 6:59 - the hearty band of randonneurs will be rolling north to Pt. Reyes Station for the first controlle, then heading back down to Crissy Field for a triumphant finish. The SF Randonneurs website has more info. The Populaire is a great way to feel out the idiosyncrasies of brevets and randonneuring. It introduces the format of non-competitive self-sufficient distance riding, and uses control cards and time limits like the longer rides. For more general information, see the RUSA.org website. Hope to see you there! Please mock me gently as I suffer up the hills. March 30th, 2012 at 6:41 am I am more under-miled than you are. Just riding to and from work and half the time I’m going multi-modal. Still, I’d welcome the opportunity to knock myself out on a populaire if one were scheduled, artwork or no. Did you go?